Francis Morice was born on June 23rd 1849 in St. John’s Wood. His father, D.S. Morice, came from Canterbury (though he was of Scottish extraction), whereas his mother hailed from Dorset. His early education was received at a number of private schools, including Uppingham, which he joined when he was eleven. Four years later (1864) he went to Winchester and, at seventeen (1866), he entered New College, Oxford. There he read Classics, gaining a second class in Classical Moderations and a first in Lit. Hum. He also won the Chancellor’s Latin Essay Prize and became the first Craven Scholar. In 1871 he was elected a Fellow of Queen’s College, Oxford. 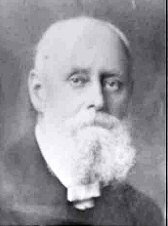 For three years he was Classical Lecturer and Succentor, and was ordained in 1873. The following year he was appointed as an assistant master at Rugby School, where he remained until 1894, when he resigned owing to ill health. At no time in his early life did he seem particularly interested in natural history. However, in 1885, he accepted the position as President of the Rugby School Natural History Society and, as a result, thought he had better take an interest in some aspect of the science. At first he took up the Lepidoptera, but shortly after the Hymenoptera attracted his attention and, from then on, he specialised entirely on this Order. At first he was particularly keen on the bees and wasps (writing, for example, an important key to the British chrysidids). Shortly after this study began he got in touch with Edward Saunders, who persuaded him to work seriously on the sawflies, a group which he studied for the remainder of his life. One of his most important publications was a series of thirty-five parts entitled “Help-Notes towards the Determination of British Tenthredinidae, etc.” [i.e. all Symphyta] published in the Entomologist’s Monthly Magazine, 1903-1916. Saunders became a friend and guide, though, as boys, they had met first in the house of Sir S.S. Saunders. However, unlike Saunders, he travelled widely throughout much of Europe, Palestine, Egypt and North Africa, always in the company of like-minded friends. Morice was also President of the Entomological Society for 1911 and 1912. His very large collection was passed to the University Museum, Oxford, following his death. Unfortunately the total number of aculeates presented is not known as the collection register for this period was subsequently lost (D. Mann, pers. comm.). When he retired from Rugby School in 1894 he moved to ‘Brunswick’, the house next to Saunders’ home in Woking. It was there that he died on September 21st 1926.